This research project can take place at any point during the IB History course. I personally deliver it towards the end of the first half term in Year 12. It is a great way to get students producing some personal research and engaging in some high-order thinking skills. The outcome of the unit is an in-depth essay on the subject of "Analyse the Methods and Conditions by which 20th Century Dictators Rose to Power". It is designed to accompany the comparative study unit on the rule of dictators. I follow and develop the investigation with a study unit on the Rise of Fidel Castro. Students use this template to record their findings about the key "Methods" and "Conditions" which led to the rise to power of the dictator they have researched. A completed sample project can be downloaded here. 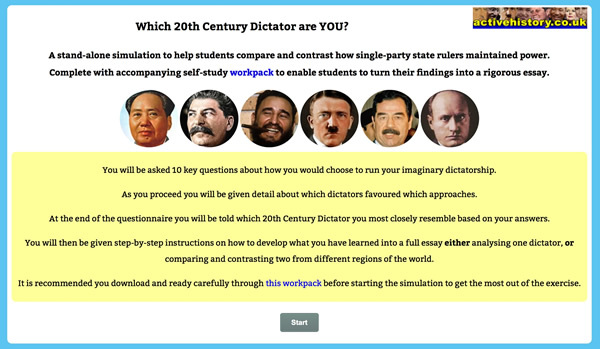 In this lesson, students start to compare and contrast the different methods and conditions used by different dictators to obtain power. Working in pairs, small groups and then as a class, they identify the most prevalent methods and conditions. They then identify exactly which dictators match these criteria and makes notes from the research templates as appropriate. Historiography - Why do dicators emerge? This activity encourages students to investigate the theories of six different historians (Marx, Davies, Huntington, Gurr, Tilly, Skocpol) whom have formulated theories regarding the causes for the rise of dictators. These theories are compared, contrasted and linked: structuralists are separated from intentionalists. 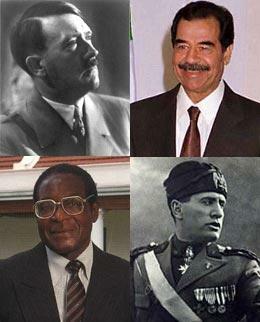 Finally, students consider which of the dictators most effectively illustrate each of these different theories. Produce an essay that looks at Methods in the first half, then Conditions. Bring in references to historians at appropriate points (e.g. Marx focuses on economic conditions). Produce an essay which looks at the Intentionalist historians first, then the Structuralists. For each historian, try to refer to at least two dictators. It is a good idea to revisit this topic by completing the ActiveHistory study unit on the Rise of Fidel Castro. Directly following the completion of the in-depth case study of one rise, or after a suitable interval later in the course, students should proceed to compare and contrast two separate dictators from different regions. To do this, they should base their investigation around the ActiveHistory interactive simulation “Which 20th Century Dictator are YOU?”. This is a stand-alone simulation to help students compare and contrast how single-party state rulers ROSE TO power. It guides students through 10 key issues explaining how and why dictatorships are able to survive. Students complete the accompanying self-study workpack to turn their findings into a rigorous essay. It also provides a great way of revising and developing their earlier essay focusing on one dictator.